Time for an update on Coco and his animals-on-tv fear obsession! Two years ago I wrote a post here called "I'd like to watch animals on tv in peace!" explaining how we were working on Coco’s tv fears. He’d come a long way at that stage, but still needed help to cope. Now look at today’s photo! He’s watching Flyball from Crufts. 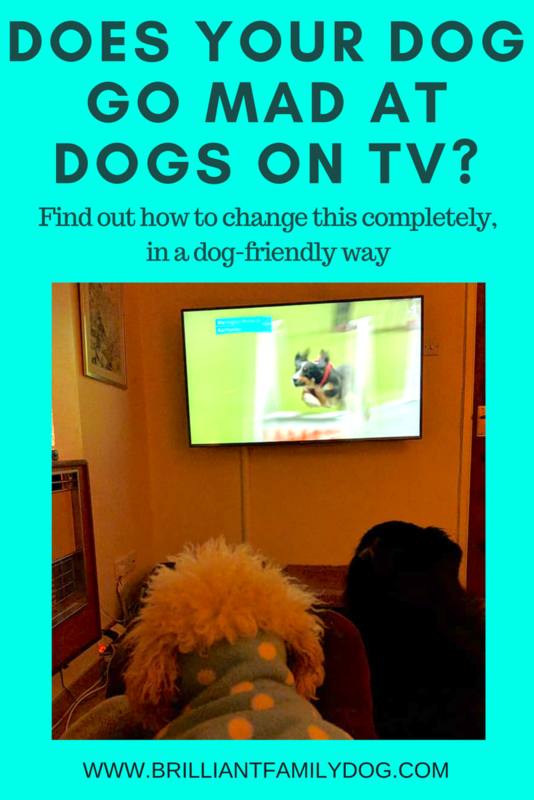 Those of you familiar with Flyball competition will know that this fast and frantic - but highly-skilled - activity involves dogs flying at speed over jumps, catching a ball and racing back with it, all accompanied by people screaming and frenetic barking. Earplugs needed. Coco was able to lie completely relaxed on my lap and watch the programme. The difference between now and two years ago is that he needed no input from me to achieve this calm and curious state. He no longer needs training or help in this area - he can cope entirely by himself. He has learned that he has no need to be afraid of the beasties on the screen, even when they're growling and coming towards him. It’s a great example of how you can change so many things your dog annoys you with. No need to put up with something you don’t like! And, of course, in this case Coco was seriously afraid, so we had to help him. Most people will make a half-hearted effort, possibly doing the wrong thing anyway by chastising the dog, and then give up. You need to know what you’re doing, how to do it, when to do it, and work out a program to achieve the results you want. And there are lots of grades of result that may suit you. You may like the dog to take himself out of the room. So you teach him that as soon as an animal appears on tv, he heads through the door for a treat. (You can start by just chucking some hard treats clattering through the doorway.) You may like him to lie in a certain bed which prevents him seeing the screen: problem avoided! Or you may like him to stay calm and enjoy the program with you. The first thing you have to address, however, is the fear! No-one can learn anything while they’re afraid. I used Desensitisation and Counter-Conditioning (DS/CC) and it slowly but surely worked. Want to know how to do this? Come and join our free 5 Day Video Workshop and learn. Well over a thousand people from all around the world already joined the first Workshop, happily meeting, encouraging and enthusing each other in the private group. Friendships were made that will last. While the Workshop is specifically geared for those of you with reactive, anxious, fearful, aggressive - Growly! - dogs, in fact anyone will learn a lot about how to build a relationship with their dog. Head over to the registration page and join us! So you want to rescue a dog? Read this first!